Cinco is the oldest of the two. 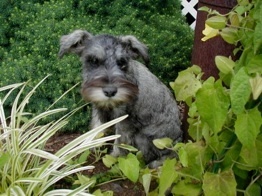 He is a salt and pepper mini schnauzer with a rather large vocabulary. Jupiter is the youngest. 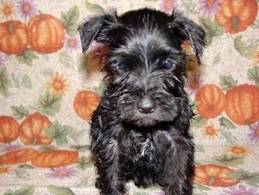 He is a black mini schnauzer with a very small vocabulary but lots of instinct. They are half brothers; the same mother but different litters. 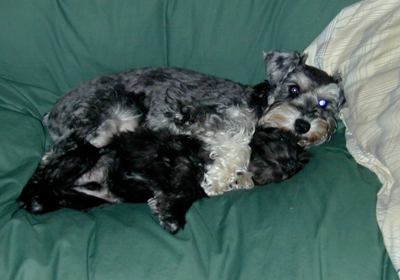 The second schnauzer was a requirement to keep Cinco from terrorizing the house and everything in it. For three days Cinco would have nothing to do with the new puppy I brought home. By the third day, they were best friends and have been inseparable ever since. Cinco is the Assistant Boatswain of SV Music but cannot tail a winch. Jupiter is the Purser of SV Music and does a good job of not spending money (unless it is for new kibble treats). They have been salty dogs since 2008. 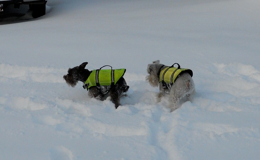 They adapted to the boat quickly and actually like their life vests. Jupiter has become a good swimmer and likes the water while Cinco prefers to stay dry. They both love to bark at ducks, kayaks, paddle boards, PWCs and anyone who dares to come near their sailboat. 2011, Jupiter turned 7 years old. He had a happy birthday as daddy walked around with a pocket full of treats and gave them to all the neighbors so they could treat the pups. They also spent their time during Hurricane Irene with the neighbors dogs. Three days of play and staging for attention. The dog are starting to get old. But they are still fun and loving. We now have most of the neighbors equipped with treats. Jupiter is blind 100% vision loss, so we have change a few of our routines - all the same he is in great spirits and we are coping with blindness - after all he is 12 years old and still going strong - there is still a bit of puppy in him. Cinco is helping a bit with Jupiter, but not much. They both got chips installed a few month ago in preparation for international travel. They now have over 1500 miles under their little keels! They are truly Salty Dogs!! !